Agreement • Herbert poised to make pivotal decision regarding water sharing with Nevada. Brian Maffly | The Salt Lake Tribune Cattle gather in Snake Valley near the Utah-Nevada state line. 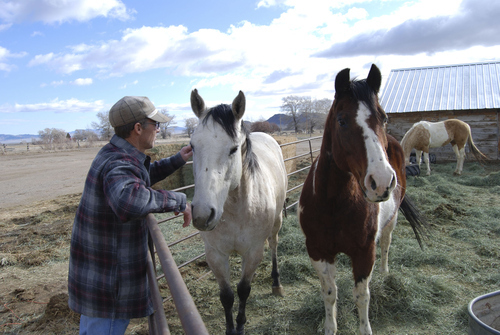 Brian Maffly | The Salt Lake Tribune Dave Baker, a third-generation Snake Valley rancher, greets his ranch hands' horses. 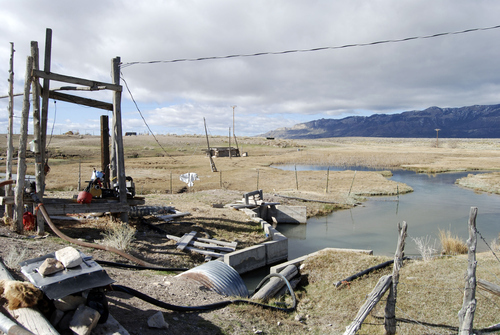 Brian Maffly | The Salt Lake Tribune An irrigation pivot stands idle in EskDale, a Utah hamlet in Snake Valley. Water is the most important resource supporting the valley's remote communities. Brian Maffly | The Salt Lake Tribune Snake Valley spring water feeds Pruess Lake, a large century-old pond near Garrison, Utah. 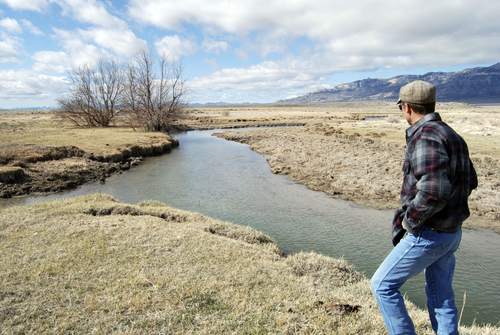 Dave Baker's family depends on this water to run their ranch, but proposed groundwater pumping could disrupt the region's hydrology and stanch these springs' outflow. Brian Maffly | The Salt Lake Tribune Dave Baker examines a monitoring station on a tiny spring that feeds his family's sprawling Snake Valley ranch. Data from this and dozens of other monitors is intended to guide controversial groundwater development proposed by Las Vegas. 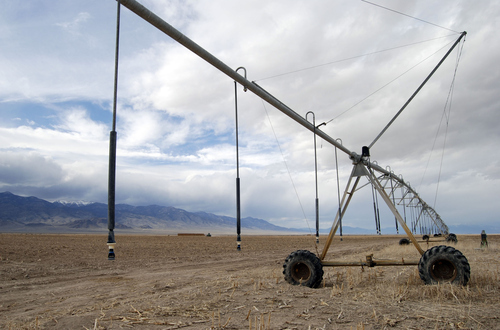 Brian Maffly | The Salt Lake Tribune Stateline Spring is a critical source of water for farmers and ranchers near the towns of Baker, Nev., and Utah's Garrison and EskDale. Local ranchers fear Las Vegas' proposed groundwater pumping scheme could turn the region into a "dust bowl," but they are divided on whether Utah Gov. Gary Herbert should sign an agreement with Nevada to divide the valley's water equally between the two states. 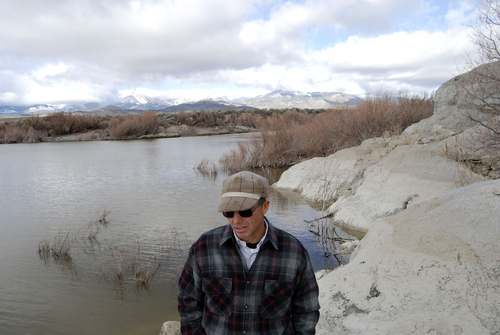 Brian Maffly | The Salt Lake Tribune A network of springs release groundwater in Snake Valley, creating wetlands that support wildlife and riparian ecosystems and providing water for the valley's agriculture. Local ranchers fear Las Vegas' proposed groundwater pumping scheme could turn the region into a "dust bowl," but they are divided on whether Utah Gov. Gary Herbert should sign an agreement with Nevada to divide the valley's water equally between the two states. 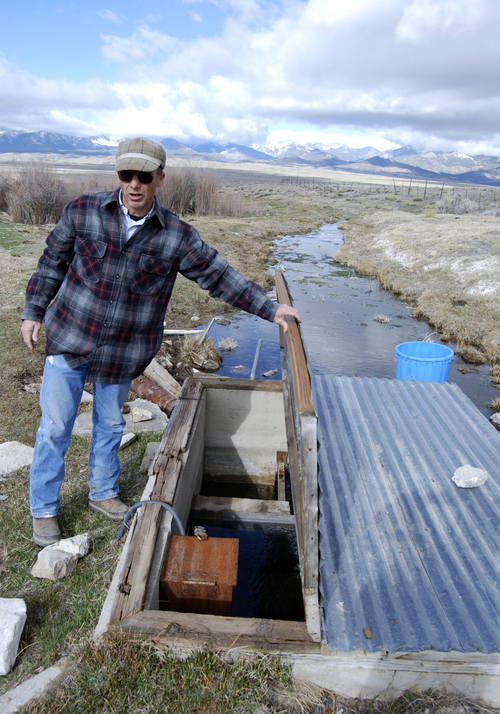 Brian Maffly | The Salt Lake Tribune Dave Baker, a third-generation Snake Valley rancher, looks at the Stateline Spring which is a critical source of water for farmers and ranchers near the towns of Baker, Nev., and Utah's Garrison and EskDale. Local ranchers fear Las Vegas' proposed groundwater pumping scheme could turn the region into a "dust bowl," but they are divided on whether Utah Gov. Gary Herbert should sign an agreement with Nevada to divide the valley's water equally between the two states. Garrison • The Snake Valley doesn&apos;t have a lot of trees. Looking across this expanse bordered by some of Nevada&apos;s highest mountains, it&apos;s not hard to see where the earth gives up its groundwater. Look for trees and willows. Natural springs lace parts of the valley, nurturing a local economy based mostly on agriculture. 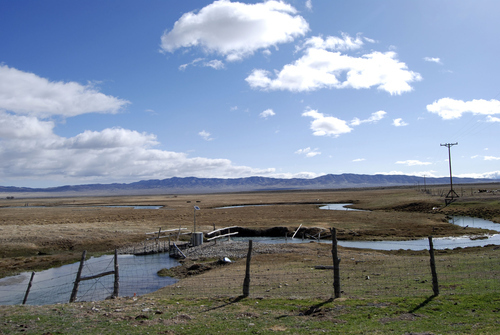 Groundwater spells the difference between prosperity or bust for dozens of ranching families scraping a living along the Utah-Nevada state line. "It&apos;s the limiting factor here," third-generation Snake Valley rancher Dave Baker says. He lifts the lid on a box covering a spring. Inside the box, equipment measures the stream&apos;s outflow as part of a Utah Department of Natural Resources monitoring program intended to guide future groundwater development here. Baker points to springs like this to illustrate the fragility of the arid environment and how wet spots like this function as "a canary in the coal mine." "It shows how vulnerable we are," he says. "We are the first ones to be impacted." Interstate standoff • This life-giving stream emerges from the same hidden resource Las Vegas wants to tap to feed the gambling metropolis&apos; future growth. The Southern Nevada Water Authority (SNWA) is securing the necessary approvals to obtain water rights in Snake Valley and four nearby Nevada valleys, build a 285-mile pipeline that could cost up to $15.5 billion and fill it with thousands of acre feet of water sucked from aquifers. The proposal has prompted a multi-year standoff between the nation&apos;s two driest states, which are also among its fastest growing. Directed by Congress, Utah and Nevada drafted an agreement four years ago to divide Snake Valley&apos;s water equally and install safeguards to prevent overtapping the groundwater. Gov. Gary Herbert intends to decide by April 1 whether to sign the agreement. At meetings in the West Desert communities of EskDale and Partoun last week he and top aides explained to skeptical residents why this agreement could serve their best interests. "I would say no [to the Las Vegas pipeline] in a heartbeat, but I can&apos;t do that. The agreement is a step in the right direction," Herbert said. "I can&apos;t stop the pipeline. That&apos;s a decision [Nevada] will make independently of us." No one has worked as hard as Baker&apos;s 73-year-old father, Dean, to thwart what many are calling Las Vegas&apos; "water grab." But now the Bakers believe Herbert&apos;s signature on the agreement could offer the best chance to stop the pipeline, or at least contain the damage it might cause. Without the agreement Vegas could be free to seek the Snake Valley water rights and develop them without consideration of the environment or Utah&apos;s concerns, the elder Baker told his neighbors last week. But many others, including Millard County commissioners and environmentalists, fear the agreement cedes Utah groundwater to Las Vegas that cannot be removed without dire consequences to both the land and its residents. If Herbert signs the deal, the SNWA would agree to wait 10 years before applying for the water rights. Critics say the agreement gives Las Vegas the green light to send up to 35,000 acre feet south each year. But if it becomes evident that Vegas&apos; pumping is harming the environment or "mining" the aquifer, then the water authority would be required to mitigate the damage and reduce its withdrawals, the governor and his advisers assured EskDale residents last week. "That&apos;s absurd. [Las Vegas] would spend billions on a water project and then just turn it off?" responded Zach Frankel, of the Utah Rivers Council. Frankel&apos;s group is part of a consortium imploring the governor to not sign the agreement. In a joint statement, the environmental groups said the agreement could set in motion a project that could wreck Snake Valley&apos;s desert ecosystems, devastate its ranching communities, and send clouds of dust into the Wasatch Front&apos;s already dirty airshed. But water authority officials say such opposition is based more on ideology than facts. The bi-state agreement is "extraordinarily protective" and guarantees the water rights of existing water users, according to SNWA spokesman J.C. Davis. "I feel badly that they are so concerned about this," Davis said. "There is nothing that our agency can say that will assuage their fears. ... The idea that the water authority, even if we were inclined to do something environmentally destructive, that we could thumb our nose at state and fed government is preposterous." A family enterprise • Fred Baker moved his family from Delta to the Snake Valley in 1955 and took over two ranches, including one that already  coincidentally  bore his family name. Today three Baker grandsons  Dave, Tom and Craig, with nine children between them  run the Baker Ranch, which employs 25 tending 1,700 head of cattle and growing hay, alfalfa and corn. The family controls five federal grazing allotments, totalling about 500,000 acres where they winter the cows and produce about 850 calves each year. 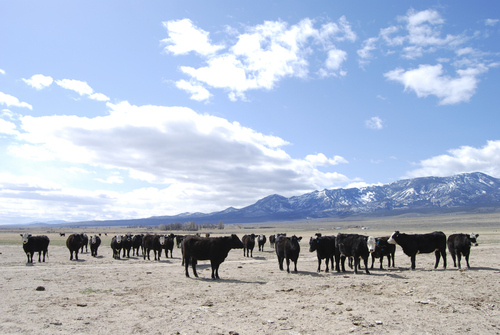 In the spring, the ranchers drive their cattle off the federal range to private holdings on productive lands on both sides of the state line near Baker, Nev., and Garrison, where they irrigate with a combination of well, surface and spring water. For years, the Bakers have rebuffed buyout offers from the water authority, which has amassed water rights in neighboring Spring Valley. "It&apos;s not rational for us to not sell and go away, but that&apos;s how we are," Dave Baker says. His youngest son, 20-year-old Clay, intends to return home to ranch after finishing college in Wyoming. "This is a great place to raise kids. That&apos;s the main point of it. They enjoy all the freedom out here and learn to be hard workers and independent," Baker says. "That&apos;s why we don&apos;t want to sell. My son would disown me if we sold. It doesn&apos;t matter how much money we get." 2004 • Congress orders Utah and Nevada to work out an agreement on allocation and management of groundwater resources in Snake Valley. August 2009 • The two states produce a water sharing agreement saying 132,000 acre feet of water per year will be made available for distribution. Each state will get 66,000 acre feet. Jan. 6, 2010 • Gov. Gary Herbert&apos;s spokeswoman says he is ready for Utah Department of Natural Resources Director Mike Styler to sign the agreement. Jan. 8, 2010 • Herbert&apos;s spokeswoman says that before signing, he wants to address concerns of the Millard County Commission and Salt Lake County Mayor Peter Corroon, who want more scientific study. Jan. 28, 2010 • The Nevada Supreme Court rules on a Las Vegas water rights case, which Styler later says will delay a decision on the agreement until at least 2011. August 2011 • Representatives of the Utah Farm Bureau, Great Basin Network and Goshute Tribe say at a public hearing that pumping water from West Desert aquifers will harm Snake Valley agriculture and Wasatch Front air quality. August 2012 • Southern Nevada Water Authority General Manager Pat Mulroy sends an email to her board saying it should sue Utah for failure to sign the agreement. October 2012 • Three water attorneys asked by Herbert to review the agreement conclude it would be an "equitable" deal for Utah. But the Millard County Commission says a 50-50 split of water with Nevada is nonsensical because Utah has historically used the most water. March 20, 2013 • Herbert visits with residents in EskDale and Partoun where he tells them that without the agreement, Nevada is free to apply for the water rights now and develop them without considering Utah&apos;s concerns. He will decide by April 1 whether to sign the agreement.